Testing method call from Collaborator that may be 0 or any other count with phpunit Framework test case can be done with expects($this->any()) from mock object. If we are using Prophecy for mocking tools, it can be done with spying. However, the spying itself need checks whenever method is called or not. We need findProphecyMethodCalls() call againsts ObjectProphecy for that. The rand() usage is just a sample, in real app, we may have a heavy logic and it may fall to not call the collaborator. Of course, it may be can’t be called ‘expecting’ before for something has done, it may be can be called as ‘recording’ what already happen, but by this usage, we can prove if it actually called in actual code. In ZendExpressive, middleware_pipeline is a config that can be used to seed pre- and/or post-routing middleware. There are two keys inside it: pre_routing and post_routing. Each of them has different purpose, pre_routing means the middleware registered under it will always be pipe()‘d before routing middleware, and for post_routing, they will be pipe()‘d afterwards. $next will bring current $request and $response which may be modified before filled. The AuthorizationAction middleware above will be pipe()‘d before middleware that registered in routes when specified middleware with its route match called. For note: As post_routing, because if the route is not match, the middleware above will be fall called, and withHeader() actually create new Response instance, we need to check whenever route match is not failure. If we check the header ( for example with Firebug or RestClient), and we can see the header ‘X-Powered-By’ changed. If we have a “not funny page”, and don’t want to modify header, then we can just not use $next. We can use one of the methods above to check $success property value. if we use other container, we can follow the docs. When we work on our “task” branch that based on our primary branch, We may have overlapped commits when our team have update the primary branch. Many people just use “merge” the primary branch into their “task” branch, but it will make extra commit that contains actually same changes, that may a project history not clean, and make hard to review (for example: in case we use merge or pull request). What we need to do is rebase instead. Actually, the merge should only happen when you need to apply your “task” branch into your primary branch. Rebase will synchronize the commits and put our changes in top of commits. Let’s see what the process step by step. For example, you work with git flow, you’re now on “feature/xzy” against develop. And we are working on a big task. On the middle of the day, someone or some people on the team make a hotfix that make a commit to master and develop, that make your branch is outdate, and has some conflict. , and fix them. After that, we can close the editor. Don’t make a commit after fixing conflicts in the files! “One penny is valueless but a lot of pennies build an empire.”. This is a tagline that we can see at the Penny repository. Gianluca Arbezzano, A PHP developer that created it focused on creating interoperability concept. It uses great PHP components in the Framework. * zendframework/zend-stdlib: used to manage configs. 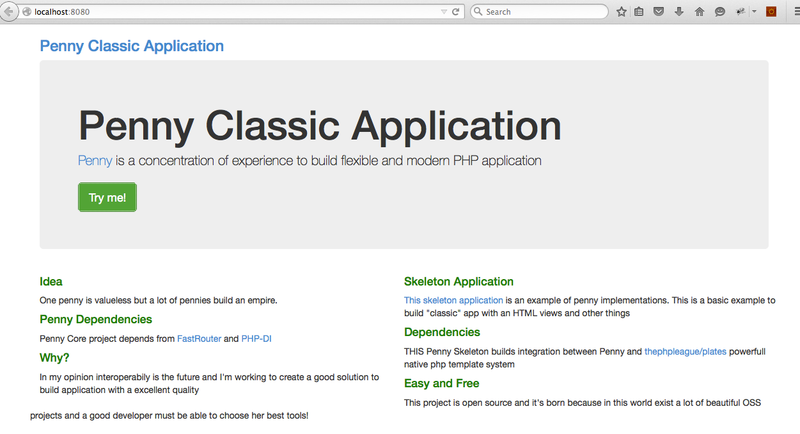 Penny ships Skeleton Application to get started, we can follow the installation steps, and we can see the welcome page. * filename.function_error: runnable but exception found. Interesting? Take a look more on the site! Curious about the code behind it? Consult the code ;).